You are here: American University Kogod School of Business News How High? 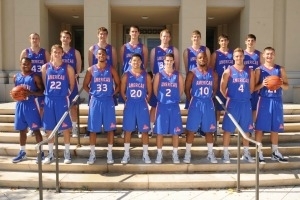 Circa 2013, when I played basketball for the American University men’s basketball team, my athletic abilities continued to progress. I could touch the net with my head, lift twice my body weight and could run faster than most people I knew. Was that my limit, though? Could I go higher? Just like my basketball accolades, I always ask myself how high I can go in life. Should I push the bar like I did with basketball, or should I be satisfied with just touching the net? If someone told me a few years ago that I’d now be in my second semester in Kogod’s Master of Science in Accounting program, I would have not believed them. But, here I am. I decided to come back to see how high I could go, and I knew that Kogod would help me push the bar. As a former student athlete, I crave challenges—both physical and mental. The biggest hurdle I faced coming back to school was the idea of becoming a better me. What is a better me? Going higher and surpassing my current limitations? Suppressing my self-doubt? What I found is that being at Kogod is becoming a better me. Kogod is like the gym, with classes as the weights and its resources as the exercises. The faculty and staff are your trainers. If you go to the gym and pick up a weight but don’t lift it, you won’t get any results. However, with the right trainer you can be pushed well beyond your own limitations. The questions you need to ask are: what is your purpose, how do you do it, and what is your vision? Graduate school is a strategic management move. Just like my decision to play basketball, I needed to know what my role was on the court, how I could perfect it, and how far I could go as a player. How high? I have been working out very hard at Kogod. I have lifted an ample amount of weights and completed a myriad of exercises—all due to my trainers. As a result, I am a Beta Gamma Sigma member, graduate ambassador, tutor and a graduate assistant. What I know is there is no ceiling at Kogod. No limitations and no self-doubt. How high? I am soaring like an eagle! For more information on Kogod’s Master of Science in Accounting program, click here.